but most of all in silence. as in a Zen meditation. Always keep to the road! If I go through the woods I can save twenty minutes. underfoot. I’m wearing my white trainers. I have a fetish for clean shoes. on the trees and sunlight skims across the water. and her body dragged beneath the green algae. from a high security jail. This is a re-write of a piece of flash fiction. I’m not sure which form works best. As I wrote this it moved away from depicting the consequences of disregarding a warning to the narrator being the agent that fulfilled that warning. If I go through the woods I’ll save twenty minutes. For weeks, the rain has been changing southern England into a blanket of black mud which slops and squelches underfoot. I’m wearing white trainers and I have a fetish about clean shoes. But today it’s dry underfoot and the pale path looks inviting. I take a few paces to get a better look at the pond which I can see through the sparse green shoots now sprouting on the trees. The sunlight skims across the water, caressing the green algae. Once I’m deep inside the woods, no-one would hear if there’s a scuffle. No-one would hear a person being bludgeoned to death and their body being dragged underwater. I take a few more steps along the pathway. No-one will ever know. A man has been charged with the murder of three prostitutes in the NE of England, following the discovery of the remains of one of them on a river. It’s difficult to understand the mindset of the perpetrators of such awful crimes. I feel the need to write about why I’ve been absent from cyberspace for almost a year. A statistical survey I did in a Maths class back in the Eighties. One girl told me that each member of her family of five had a TV in his or her bedroom, which was also where they took all their meals. A report that Simon Cowell can’t use an ipod. A short story, written by E M Forster called The Machine Stops. In this futuristic fantasy, all the inhabitants of the earth live in a honeycomb of cells below the earth, where all their needs are provided by the Machine. Communication takes place through a round, hand held plate which glows before lighting up to reveal the image of the caller. I like to think that I’m pretty savvy when it comes to digital technology; I bought my first computer in 1999 so that I’d be able to e-mail my daughter in China. In that instance, having a computer was a good thing. I don’t own an ipod, although I can see that they are handy on a journey or when out jogging. Like Cowell I sometimes find ipods intensely irritating and I preferred the days when listening to music was more of a social activity. I was, however, horrified by the image of my pupil and her family sitting in their individual ‘cells’, eating their meals and watching TV. Also back in the Eighties, the daughter of a close friend told her mother that our families were the only ones who still sat round a table to eat a Sunday roast. 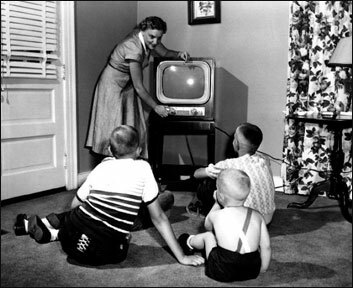 I suppose that by removing watching television from the social sphere prevents rows over which channel but it also rules out the pleasure of shared social activity. In the twenty-first century we can now watch whichever programme we like, catch up using devices like BBC iplayer and watch DVDs; all without leaving our laptops. Now don’t get me wrong, I love having from all over the world, but I did start to feel the need for more face to face communication and social interaction. Many people manage to get the balance right, but looking around me, I do see society moving in the direction of Forster’s dystopia. I’ve been absent from my site ever since completing a poem a day with ReadWritePoem last April. I decided I was whiling away too many hours at my computer and life was slipping by fast. I intend to return soon but to try to be less obsessive. So this is it. Day #30 and I have six words left from Read Write Word #15. I have more than thirty poems. I have made some wonderful new blogging buddies whose poems I will continue to read and the prompts have been amazing. more like a magical mystery tour. in my piggy bank of poems.